She Loves Tech the world’s largest startup competition focused on women and technology is coming to the Philippines. The Philippine leg of the competition will be held on July 31 at the QBO Innovation Hub, co-organized by QBO with the support of the Department of Science and Technology (DOST). 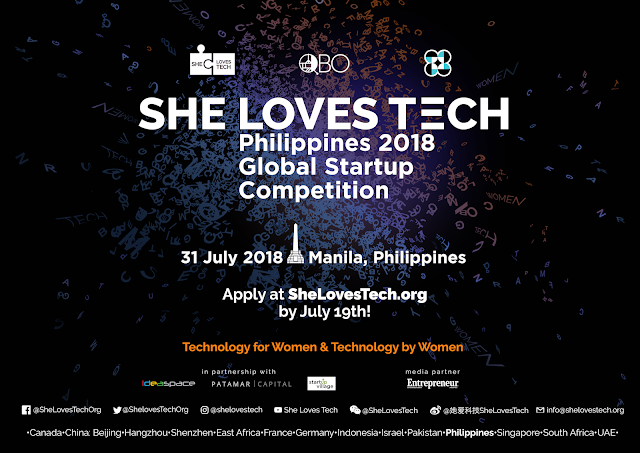 With regional competitions held in 15 locations around the world, She Loves Tech will culminate in Beijing, China where the winners of each region will compete in the global finals on September 15, 2018.
startup founders. Similarly, in a study conducted by iPrice.ph, women represented only 18.5% of the most successful Philippine startup entrepreneurs studied. In order to share the capacity of women to be leaders of industry as well as empower more women to get into the startup ecosystem, QBO partnered with She Loves Tech. this year’s She Loves Tech Pitch Competition. mentors, investors, and other supporting organizations. with China’s leading tech ecosystem players. coming out of the global competition. • Are a significant proportion of end-users or consumers female? • Are products specifically designed with women users in mind? • Does the product itself address a problem that disproportionately affects women? everything from hardware to the creation of new product and solutions to existing problems. Global Startup Competition ends on July 19, 2018.